You will need little paper cases for these cakes. If you would like different citrus flavours, make several batches using this recipe. Preheat the oven to 200°C/gas 6. Arrange 12 double-thickness paper cases on a baking tray. Beat the butter and sugar until pale and fluffy, then beat in your chosen citrus zest, followed by the egg. Sift the flour and salt into a bowl. Using a metal spoon, quickly fold the flour into the butter mixture followed by a tablespoon of your chosen citrus juice. Spoon the mixture into the paper cases and bake for 15 minutes until they are well-risen and golden. If you press a cake lightly, the sponge should bounce back. Cool on a wire rack. Sift some icing sugar into a bowl. Add some of your chosen citrus juice into the icing sugar until it forms a thick icing. Dip your knife in hot water and carefully spread the icing over the top of each cake. It will creep further down each cake as it sets. Once firm, gently press in your garnish. Before packing, remove the extra paper casing. 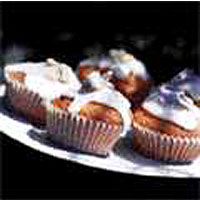 Always store in an airtight container as these cakes are best eaten on the day of baking or the following day.